John Elway (No. 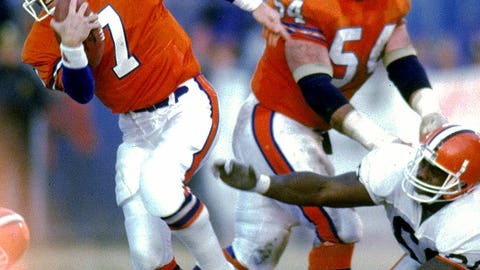 7) and the Broncos tormented the Browns in the '80s. Here, Elway skirts a tackle in the AFC title game in January 1988. It’d be safe to wager that Cleveland Browns fans with long memories don’t like it when legendary Denver Broncos quarterbacks come to town. This Sunday, Peyton Manning rides into Cleveland with his 5-0 Broncos. But it was Manning’s current boss, John Elway, who ruined back-to-back Januarys for the Browns and their fans in the AFC Championships of the 1986 and 1987 seasons. He may want to get a private security detail if he plans on attending the game this week. On Jan. 11, 1987, Elway led "The Drive" — a 98-yard march that started with 5:32 remaining and the Broncos down 20-13. Elway converted three crucial third downs, including a third-and-18 that went for 20 yards. The Broncos tied the game and eventually won in overtime. The next year, on Jan. 17, 1988, Elway and the Broncos hosted the Browns at Mile High Stadium and jumped out to a 21-3 lead. A ferocious second-half comeback led by Browns quarterback Bernie Kosar that included four touchdowns got the Browns within 38-31. The Browns almost pulled a reverse Elway. Same as how the Broncos charged back to tie late the year before, Cleveland was poised to tie the game and send it to overtime. With 1:12 left, Browns running back Earnest Byner fumbled while trying to score a touchdown that would have given his team a chance to tie. The Broncos went on to win 38-33. The photo below shows Jeremiah Castille with the prize after stripping the ball and also recovering it. 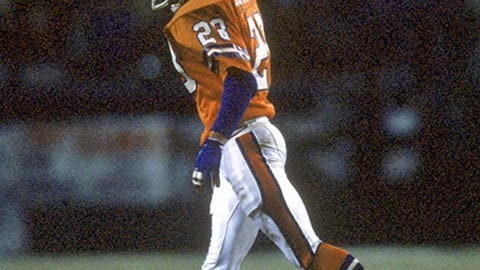 Denver Broncos cornerback Jeremiah Castille recovered the fumble by Cleveland Browns running back Earnest Byner. The Browns also lost the 1989 AFC Championship to Denver, but we don’t want to pile on. If it’s any consolation to Browns fans, Denver lost those three Super Bowls by a combined score of 136-40.